The author of the wildly popular The Kind Worth Killing returns with an electrifying and downright Hitchcockian psychological thriller—as tantalizing as the cinema classics Rear Window and Wait Until Dark—involving a young woman caught in a vise of voyeurism, betrayal, manipulation, and murder. The danger isn’t all in your head . . . When she reaches out to her cousin, he proclaims his innocence and calms her nerves . . . until she comes across disturbing objects hidden in the apartment—and accidently learns that Corbin is not where he says he is. Could Corbin be a killer? And what about Alan? Kate finds herself drawn to this appealing man who seems so sincere, yet she isn’t sure. Jetlagged and emotionally unstable, her imagination full of dark images caused by the terror of her past, Kate can barely trust herself . . . So how could she take the chance on a stranger she’s just met? 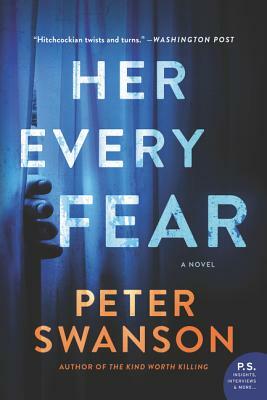 Told from multiple points of view, Her Every Fear is a scintillating, edgy novel rich with Peter Swanson’s chilling insight into the darkest corners of the human psyche and virtuosic skill for plotting that has propelled him to the highest ranks of suspense, in the tradition of such greats as Gillian Flynn, Paula Hawkins, Patricia Highsmith, and James M. Cain. Peter Swanson is the author of three novels: The Girl With a Clock For a Heart, an LA Times Book Award finalist; The Kind Worth Killing, winner of the New England Society Book Award, and finalist for the CWA Ian Fleming Steel Dagger; and his most recent, Her Every Fear. His books have been translated into 30 languages, and his stories, poetry, and features have appeared in Asimov’s Science Fiction, The Atlantic Monthly, Measure, The Guardian, The Strand Magazine, and Yankee Magazine. A graduate of Trinity College, the University of Massachusetts at Amherst, and Emerson College, he lives in Somerville, Massachusetts with his wife.